The third version of our small business IT protection kit, Kaspersky Small Office Security, has been released. Let’s take a closer look at what’s available in the new solution. This product review describes the ten most interesting and useful features. First of all, it should be noted that everyone can try KSOS before purchasing it. The trial version may be downloaded here: for thirty days it will be fully functional. The file size is 205 megabytes. Kaspersky Small Office Security is designed for small companies that may not have full-time professional system administrators. In such cases, employees are engaged in administration and they are not fond not of having to spend a lot of time on these activities since they have other tasks to handle. 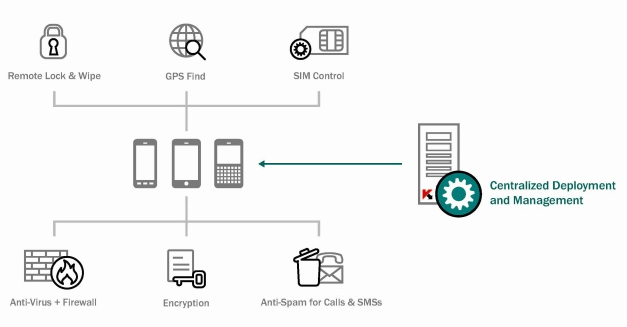 A key feature of KSOS is the simplicity of the interface. Kaspersky Small Office Security contains all the necessary tools to protect individual computers and local area networks. Protection components include antivirus software (file antivirus, email antivirus, network antivirus and instant messaging antivirus), applications launch control, firewall, network attacks blocker and other tools. All of these can be enabled or disabled by the administrator (or whoever performs his/her function), and may be configured separately. 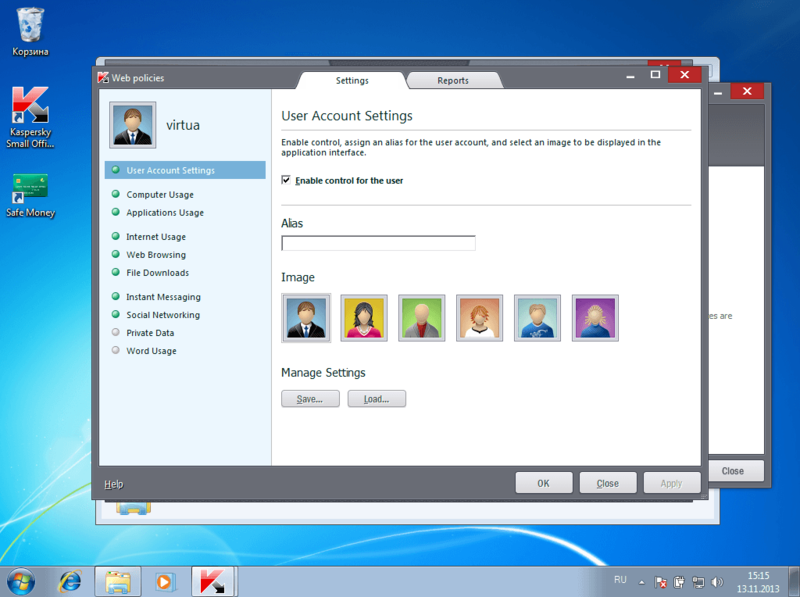 This aspect of the software offers five options for backing up data: folders in “Desktop” and “My Documents”, video files, images/photographs and music. 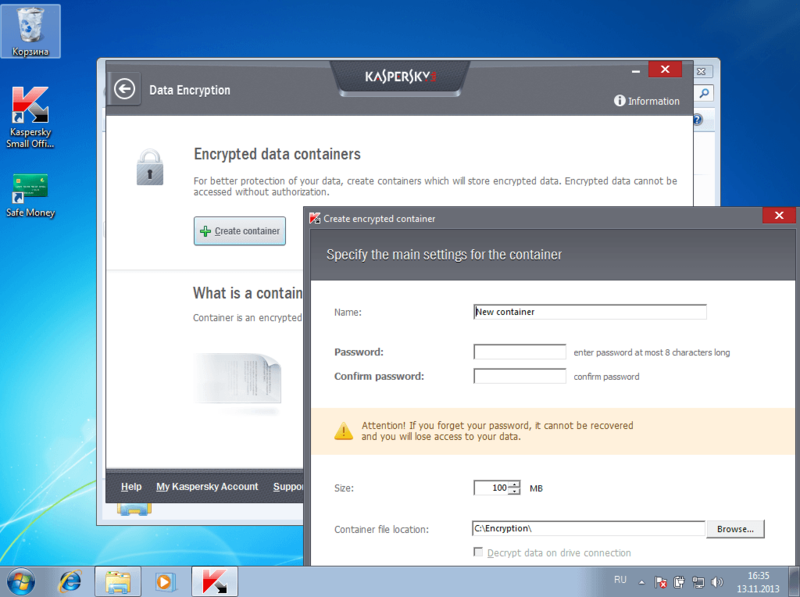 Kapsersky Small Office Security automatically analyzes the contents of folders, counting the number of files and the amount of data. The fifth option is to manually select folders to back up. Auser is asked to set the backup schedule, the number of copies and the location of the archives. There are local drives as well as popular services like Dropbox among the options. 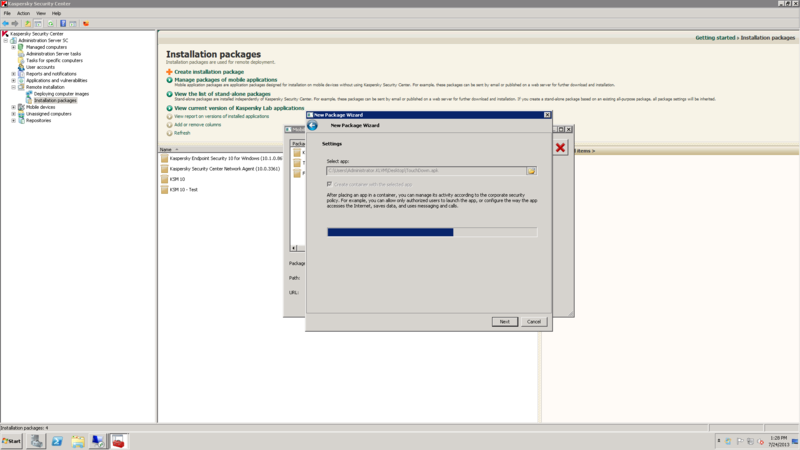 Configuring web policies may be the most time-consuming for a user when doing it for the first time. Web policies are disabled by default. The options are: Collecting Data (of user actions), Soft Restrictions (with user activities logged and access to undesirable resources blocked), and Hard Restrictions (adding forbidden file downloads). Custom settings are available too, allowing you to set rules for using the computer (or computers) in general. Specific applications, web resources, instant messengers, social networks, and even certain words and phrases can be blocked. The level of strictness is entirely up to the business owner. By returning to the main screen and clicking the up arrow in the lower right corner you can open the full menu. This function allows you to reduce the burden of remembering passwords by saving users from having to memorize dozens of passwords for multiple resources. 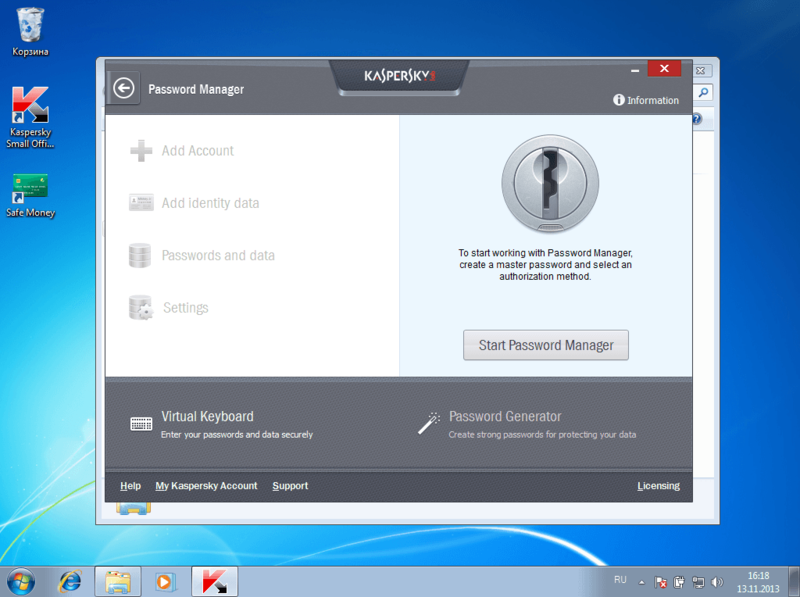 Password Manager allows an administrator to assign a master password, generates crack resistant pairs of logins and passwords for different resources and stores them encrypted in a specified location (for example, on a flash drive). Passwords are entered automatically. This function is often neglected. However, if the company processes any sensitive personal information of other people, encryption becomes a necessity. This option allows users to create a container (or connect one that already exists). For example, a container could be a password-protected folder on a local or external drive where the data is stored in an encrypted form while remaining accessible only to those who know the password. 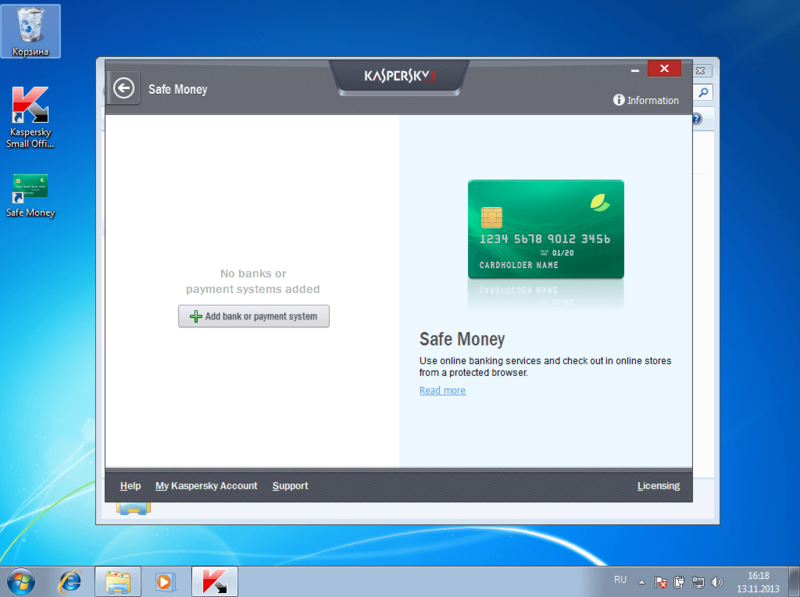 This application protects all financial transactions by automatically launching an ultra-secure browser. With the growing prevalence of online banking, more and more criminals are eager to profit at the expense of e-banking users. All kinds of phishing or grafted malicious software are used. Safe Money eliminates the likelihood of such attacks. 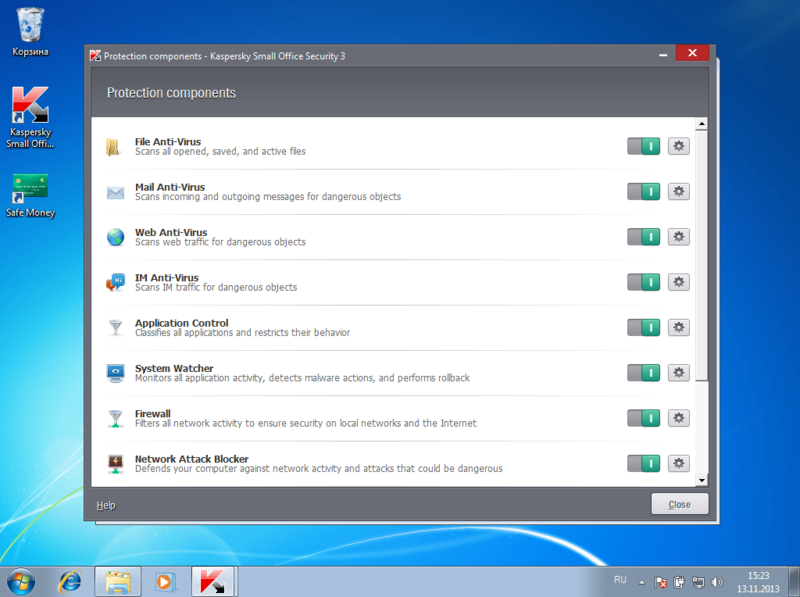 Kaspersky Small Office Security allows you to monitor all activities in the local area network. We have repeatedly pointed out in our previous publications that it guarantees the secure infrastructure of the company. 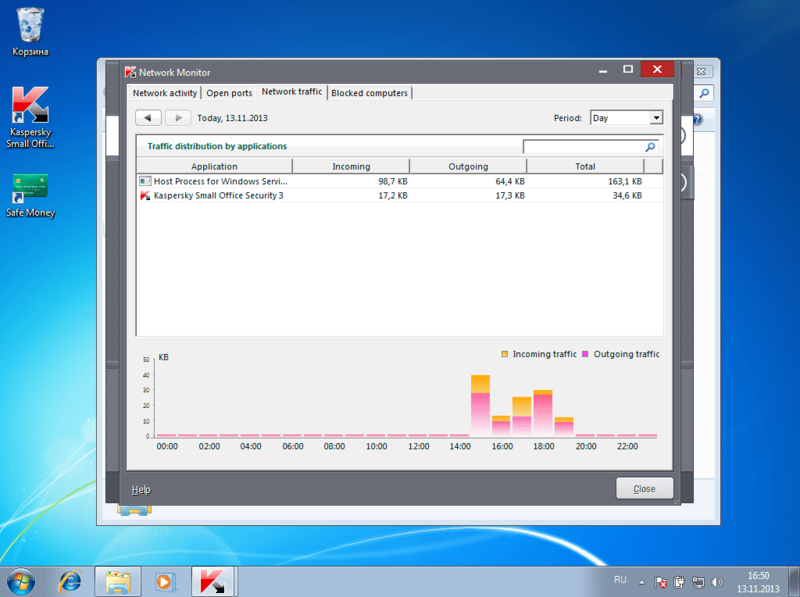 By triggering the appropriate function, the administrator (even a provisional one) gets a visual representation of inbound and outbound traffic for each computer on the network, and what applications process what amount of the data. This feature allows you to inspect every process on your computer: how much memory is used, what share of system resources is taken. Moreover, the legitimacy of launching applications is clearly indicated for each action, so activities of questionable applications are instantly visible. 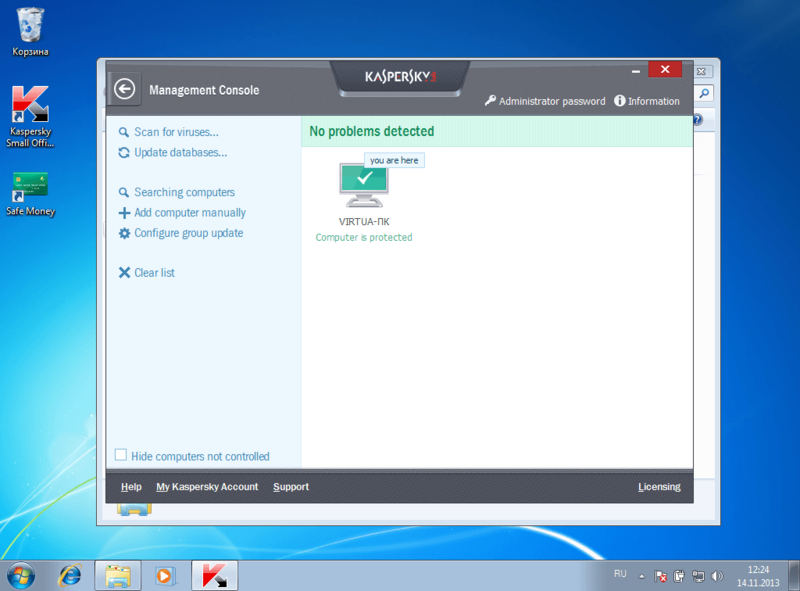 The General Management Console allows you to remotely change the security settings for each computer with Kaspersky Small Office Security on the local network and scan all resources. Kaspersky Small Office Security is designed for small companies that may not have full-time professional system administrators, but still require expert protection, like any other. Tools are a set of additional “safe” instruments for protecting data. This section allows you to inspect the browser security settings (Internet Explorer) and change them, if necessary. You can create a backup boot disk (CD or flash drive) and reset the Windows settings if they are damaged by malware. Functions like File Shredder (complete removal of data without possible restoring), Erase Your Activities History (cleaning activity log) and Unused Data Cleaner (deleting the contents of the recycle bin, browser history, temporary files, and so on) are extremely useful. 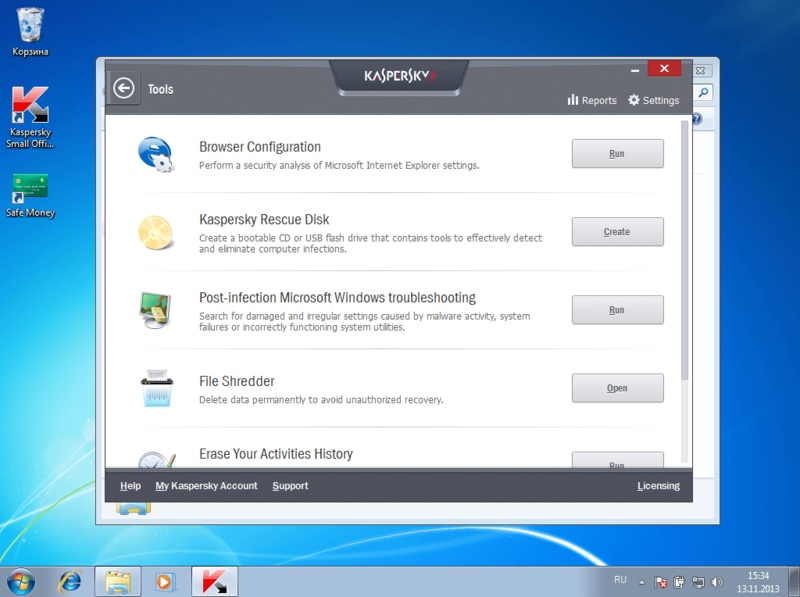 In the next post, we will focus more on how and when to use the tools available in Kaspersky Small Office Security. The trial version of the package is available here. Have A Visa? Don't Share It.